Nose: slightly herbal, sweet, apples and pears, floral. On the palate: Good body, sweet, mellow, slightly tart, almond, fresh apricot. Finish: Oranges, apricots. Fairly quick, but the sweetness lingers for a while. Parting Words: Smith & Wilson produces a fairly wide variety of wines for such a small producer. Their wines can only, to my knowledge, be purchased at their tasting room in Blenheim. They have a nice variety of reds and whites, and many of the reds are quite good, especially with age. They’re not chicken, either. 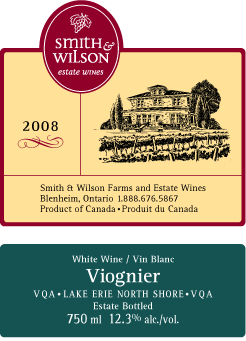 Viogner is a fickle grape, especially in a fickle climate like the North Shore of Lake Erie. They also make a double barrel-aged Cab Franc/Merlot/Syrah blend that is very good as well. It’s worth stopping if you are driving between Detroit and London, Ontario.